The 15-year gilt yields increased slightly during August up 3 basis points to 2.07% after being as high as 2.27% earlier in the month and at an all time low of 2.02% on 2 August 2012. The European Central Bank (ECB) said it would do "whatever it takes" to support sovereign countries that find themselves requiring a bailout and investor confidence increased in July. On 6 September 2012 the ECB will give details of how it can achieve this and as the meeting approaches investors have moved funds back to safe havens such as UK government bonds and gilts. A positive outcome would mean both equities and gilt yields will increase as investors have more confidence in European bonds where the yields for 10-year bonds in Spain are at 6.23%, Italy at 5.69% and Portugal at 9.46%. Despite the slight increase in gilt yields annuity rates have reduced with standard, smoker and impaired annuities lower by up to 4.1%. Standard annuity rates are lower by 1.99% and smoker rates by 0.92%. 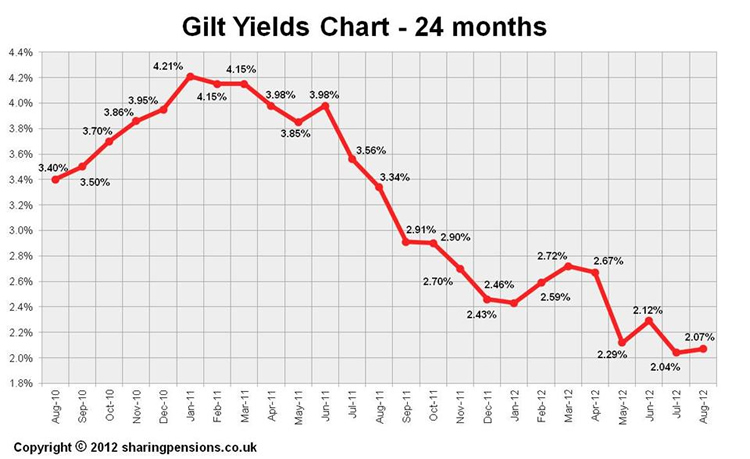 With gilt yields virtually unchanged it would appear that annuity rates can increase in August by between 1.22% to 2.29%. For the latest updates see Annuity Rates 2012.